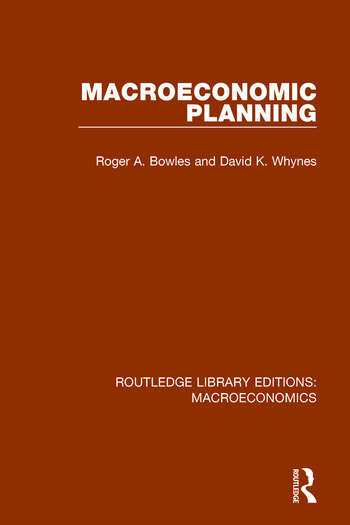 This volume, originally published in 1979, examines systematically the nature of control in both capitalist and socialist economies, develops a theoretical and applied framework which can embrace both macroeconomics and plannng and demonstates the essential unity of all forms of macroeconomic planning by the consistent application of basic economic principles. Firstly, the authors establish why societies feel a need for government control and examine the mechanisms by which such social decisions are reached. Next they examine the nature of economic data, the modelling of economic systems nad a review of practical policy goals and instruments. The book then reviews the basic theory of optimisation and elaborates it in the context of planning for growth, for stabilisation and under uncertainty. It closes with an analysis of practical planning based on French and Soviet experience. 1. Macroeconomics and Planning 2. The Need for Planning 3. The Derivation of Planning Objectives 4. The Nature of the Economy 5. Optimisation 6. Planning in Practice 7. Conclusions.